The last remaining pier from the Cooper River Bridge will soon serve as a tribute to the traditional colors of Charleston’s historic buildings. Jim Weinberg, who moved to Charleston with his wife Linique in April, has spearheaded the project, which will transform the concrete structure into a palette of 10 colors. 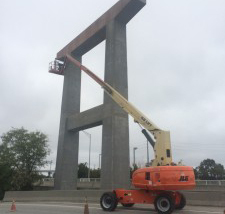 The top will be painted with the word “Charleston,” which only be visible by air. An interior designer by trade, Weinberg donated his design time for the project. The pier is located on East Bay Street, next to the on ramp to the Ravenel Bridge. The previous bridge was torn down a decade ago when the Ravenel opened.